Red Shoes have Lift Off! This is my story. The red shoes sat untouched in my closet for 2 months. They looked like cheerful outcasts in a sea of black. I was committed to ignoring them. Then one day (don’t know what came over me) I put them on and walked out the door. To say it was an “Oh WOW” kind of day is an understatement. Everywhere I went people made eye contact, smiled (was it my imagination or were some winking? ), said “love your shoes” or words to that effect and some initiated conversation. I had no idea so many people noticed shoes! Interestingly they came from all walks of life; male and female, young and old. I waltzed through the day uplifted, euphoric and with a smile from ear to ear. Wearing these shoes was like having a puppy! That night my mind searched for an explanation. How can shoes garner this kind of attention? Were the shoes ‘happy’ or was I happy in the shoes thus radiating an abundance of positive energy and drawing people to me? Not finding an answer but realizing this warranted further investigation I wore them the next day. You guessed it…the same thing happened. What a wonderful way to go through the day. I started to think of how people were taking a moment to connect with me and how many times it had been on the tip of my tongue to offer a compliment or words of encouragement to a stranger but instead I remained silent. I missed so many opportunities to make contact. My words could have uplifted, given hope or turned a bad day good just as these exchanges had for me. I vowed to pay if forward and seize every opportunity to connect with another. Not a bad lesson from a pair of shoes! I also decide to extend the experiment and commit to wearing the red shoes everywhere I go (except the gym) for 2 weeks. OK… I confess I’ve never been a member of The Women Who Love Shoes Club. I do not collect shoes, I do not form emotional attachments to shoes and my heart definitely does not go pitty pat in a shoe store. I’ve always loved fashion but shoes are functional – to provide comfort, to keep my feet dry (I live in the Pacific Northwest) and to make me taller (I love it when my 5’6” self miraculously grows to 5’9”+). So it’s more than a little strange when I find myself on Day 1 of the ‘experiment’ looking forward with anxious anticipation to slipping on the red shoes (aka magic shoes). My first stop is to pick up a prescription for my husband at the drug store. As usual my energy level is running at maximum capacity. I stand waiting at the pharmacy, I can only imagine I am on vibrate as I wait and make mental lists of to do’s for the day. My mental gymnastics stop suddenly when I hear, “love your shoes” in a low, raspy voice. I look and am confronted with a small elderly gentleman sitting patiently in a chair. He smiles. He pats the chair beside him and twinkles as he says, “have a seat…take a load off”. I return the smile and do exactly as he says. “I’m not normally a shoe man but those are great shoes” he offers. Every ounce of tension and urgency drains from my body. I laugh as I tell him these might be magic shoes and give a brief recount of the red shoe story. “You got them in California? That’s where my daughter lives” he volunteers. “Mine too!” I respond. “Mine lives in San Jose” he adds. “Mine too!” I counter incredulously. Without relaying the entire conversation we found we had many things in common. He had even been to the shoe store in Capitola. We chatted for about 10 minutes before we parted. As I prepared to leave I told him how much I enjoyed our time together. The red shoes had introduced me to a lovely gentleman who offered snippets of his life in such a generous, open hearted way. Our meeting showed me that life takes place in the present moment. I realized that every day is full of miracles, gifts and opportunities. There are people and circumstances waiting to teach me lessons, warm my heart and make life richer. I vowed to be PRESENT! I don’t want to miss anything! I was leaving my doctor’s office and striding towards the elevator. A woman (whose age I would guess to be 50’s/60’s) was waiting, watching the floors tick by on the downward descent. “GREAT shoes”, she offers as I join her. “Thank you”, I laugh and launch into a now, oft repeated story of the red shoes and how if it weren’t for my shoe loving friend I wouldn’t own them, be wearing them today and having extraordinary experiences. The woman considered my story, looked me in the eye and said, “If NOW is not the time to BOLD and DARING …. WHAT IS???? YOU GO GIRL! They look fabulous on you! You’ve inspired me to go out and do the same! Thank you! I’m not waiting for the elevator I’m taking the stairs!” With that her (now) explosive energy took off down the hall! I heard the door open and slam shut. I stood there taking it all in. I stepped into the elevator. Be BOLD, be DARING if not NOW when? The doors opened on the ground level. I stepped out. I knew in that moment the penny had dropped. I had shifted. It had been a combination of many things but all had been triggered by the red shoes. They nudged me out of my comfort zone in such a playful, fun way. They tickled my brain as I looked for (and totally expected) positives experiences. They tapped my inner happy, put a spring in my step and a song in my heart and drew others to me. They forced me to stay anchored in the present moment by the consistent wave of upbeat comments from strangers and finally the emphatic words of a woman who appeared to be inspired by me. But really it had been she who put it all together. Be BOLD Be DARING – do it NOW! Do what’s in your heart…what reflects your passion. Your purpose will become clear. Your legacy will be in service to others. I owe enormous thanks to the red shoes and all the wonderful people who brightened my day. The lovely gentleman in the drugstore who taught me to live in the moment, the woman at the elevator who said Be BOLD Be Daring NOW (before it’s too late) and most importantly my friend Cheryll who was prepared to do back flips to get me to buy the red shoes! The red shoes had been put into my life to offer me understanding and insight. While I admit the delivery method was unorthodox the lessons were nonetheless profound. There are many more red shoe stories. I have relayed the three that delivered the most impactful messages to me. Seize every opportunity to connect with people. That connection has the power to transform someone’s day. Live in the present moment. That’s where LIFE is! Be BOLD be DARING… NOW — don’t wait. Our time here is short. Oliver Wendell Holmes once said, “Most people go to their graves with their music still in them.” Is it because they’ve never heard the music or don’t know it’s there? The woman at the elevator knew. Approach each day expecting positive experiences and that is exactly what you will get! A happy, upbeat attitude is like a magnet drawing people to you. I wore the red shoes to my book club. These are 10 women who have been great friends for more than 20 years and until that day I did not know 80% were Women Who Love Shoes and boy did they love the red shoes! 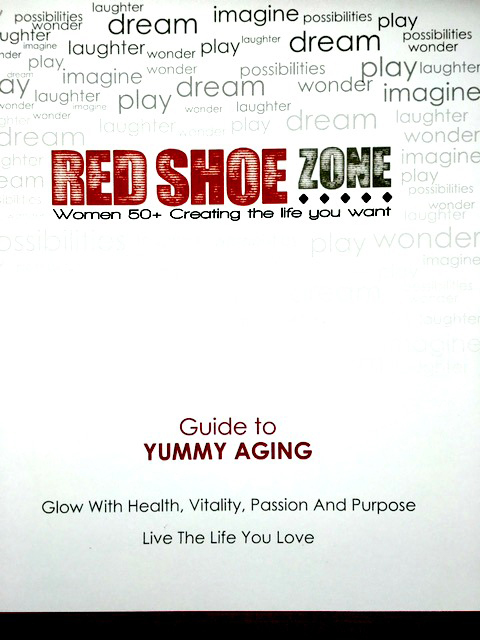 We concocted a plan – The Red Shoe Project. We would pass the shoes and take turns wearing them. A great idea except only 3 of us have the prerequisite BIG (size 9) feet necessary for the red shoes. It was agreed Lee and Lainey would wear them. I would approach my friend Claire who’s always up for anything. We were about to become a sisterhood.